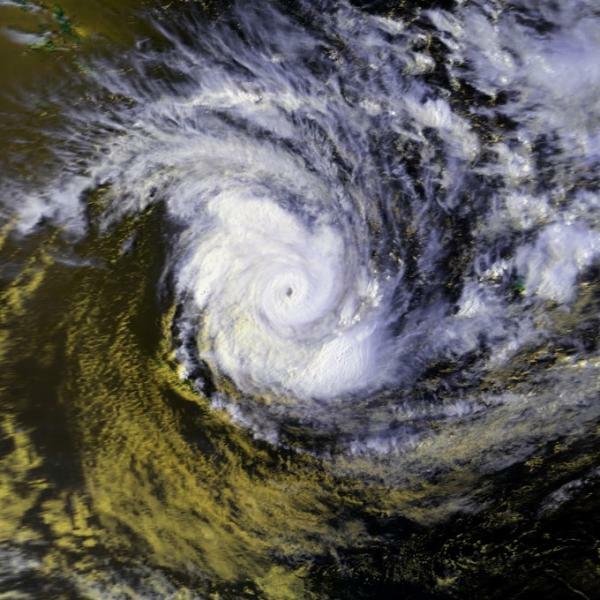 Cyclone Bola is mostly remembered for the flooding it brought to the Gisborne district, where it caused an estimated $90 Million worth of damage. Rainfall as high as 419mm in 24 hours was measured at one place and several others had almost 1000mm over four days. When floodwaters rose and broke through the stop banks of the Waipaoa River, 3000 people had to be evacuated from the Poverty Bay plains. Further north near Tolaga Bay, three people drowned after their car was washed off the road while being towed by an energy board truck. But a courageous energy board worker managed to swim across from the truck with a rope tied round his waist and rescue two others. By the time he got back to the truck, the rising water had entered the cab and it too was in danger of being swept away. They in turn had to be rescued by a school bus driver who managed to get his four wheel drive out to them with the flood waters lapping at the windows. The railway line to Gisborne was cut when the Waipaoa River washed away a section of the railway bridge and in Wairoa, the bridge carrying the state highway was destroyed. Thousands of sheep drowned and thousands of acres of crops inundated. Countless slips and landslides came down and millions of tons of alluvium filled the rivers. When the floodwaters finally receded, silt a metre or more deep covered large areas of farmland and orchards. So much horticultural produce was washed out to sea that fruit was still being dredged from the ocean floor in fishing nets several months afterwards. A number of factors combined to make the rain so exceptionally heavy. To begin with, the tropical air in the cyclone was very warm and humid and so contained a large amount of water vapour. Then cold air from south of New Zealand happened to be moving up the east coast towards Gisborne as the cyclone approached and, being denser, sank under the tropical air, forcing it to rise (see isobar map above). The upward air motion was further increased by gale force easterly winds blowing straight into the ranges west of Gisborne, so the conditions favouring rain persisted for a number of days. The floods in Gisborne were described as the worst of the century, but it was not the only area that suffered from the heavy rain. Flooding in Northland was said to be the worst in 30 years and thousands of farm animals drowned. It is also interesting to note, however, that some places between Northland and Gisborne had far less rain. Large areas of the Bay of Plenty, for example, had less than a tenth of the rain that fell in Gisborne because they were sheltered by the Raukumara Range. As the air rose over the mountains it dropped most of its rain before or near the main divide, then as it descended on the Bay of Plenty side, it was warmed by compression and dried out further. Auckland was also partially sheltered by the Coromandel Range and the city received less than half the rain that fell in Whitianga. Similarly, parts of Taranaki and Waikato had almost no rain during the time the wind was blowing from the southeast. But in Northland the wind blew straight off the sea and there was no protection from sheltering hills. Aside from flood damage, a lot of havoc was also caused by strong wind. These were most violent downwind of the main ranges, so those areas which had been sheltered from the worst rain had gales to contend with. The downwind increase occurs because as air flows over a major obstacle like a mountain range, large wave motions are set up in the atmosphere, like those in a stream when water flows over a rock. These waves then bring the stronger winds from higher levels down to the surface. The pine forests in the central North Island suffered badly with around 17,000 ha of trees uprooted or snapped off. Taranaki was also severely battered with thousands of trees blown over and about 500 houses damaged. In New Plymouth a man trying to repair his roof received multiple fractures when he was blown to the ground and rolled 30 metres down the road. The strong winds were also responsible for a fire getting out of control in the Marlborough Sounds and destroying a large area of native bush. 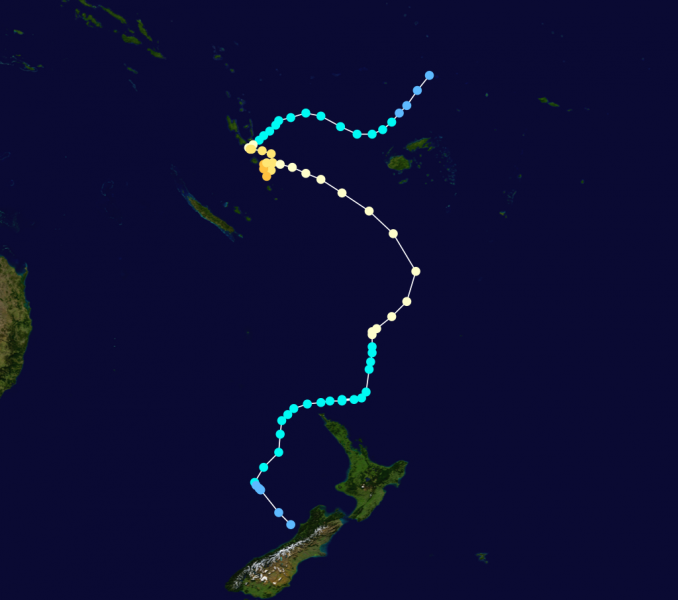 Weather map from 11th March 1988, showing Cyclone Bola (L) to the west of New Zealand. Areas like Taranaki and Nelson that initially had little or no rain when the wind was blowing from the southeast, were caught when the low centre moved across to the west of the North Island, then south (see isobar map above). Onshore northerly winds then brought heavy rain, causing several rivers, including the Takaka, to flood.